Virgin Vapor is a little bit different than other e-juice providers, specifically known for their high quality, organically flavored e-liquid. Like most companies featured on our website, all of their ingredients are U.S. sourced, but they contain no artificial colors, flavors or sweeteners. 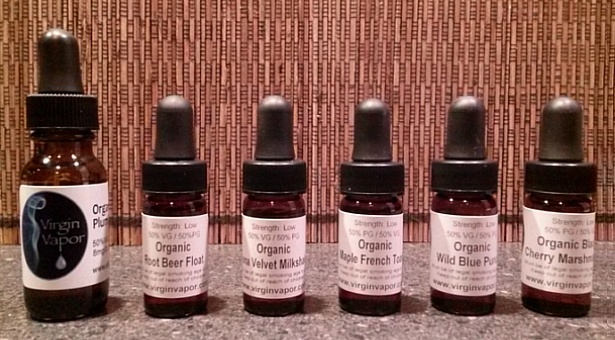 With dozens of different flavors, Virgin Vapor is a leader in purity – 100% ORGANIC & ADDITIVE-FREE. If purity is your primary concern, Virgin Vapor e-liquid is, by far, one of the best options on the market. Although the company is small (based out of Lower Lake, CA), their dedication to producing high-quality, organic e-juice is second to none. All of their ingredients are U.S. sourced, certified organic and contain no artificial additives. This means no DEG, no artificial flavorings, no artificial colorings and no artificial sweeteners. They even use glass bottles to prevent chemicals from leaching into your e-liquid. Virgin vapor offers two different base options – 50/50 PG/VG or 100% vegetable glycerin. All PG is USP certified, and their VG is not only USP pharmaceutical grade, it’s certified organic as well. Unlike some companies that use flavorings containing propylene glycol, Virgin Vapor’s 100% VG is truly propylene glycol free. With nearly 100 different flavors to choose from, Virgin Vapor has quite a selection of unique and creative products. It’s obvious that Annette, the owner and “head chef”, has put a lot of time and effort into creating a distinctive line of e-juice that stands out from the crowd. Although our experience with Virgin Vapor was limited prior to this review, we chose three appealing flavors for our initial testing and Annette was kind enough to send us three additional samples. Especially popular with PG-sensitive vapers and 100% VG fans, we chose 50/50 PG/VG (at 8mg nicotine) since our team prefers PG/VG combos. We let it steep for a month and all three members of our team vaped each flavor for at least 24 hours, giving us plenty of time for an accurate evaluation. Organic Black Cherry Marshmallow (4.5/5) – Described as “true black cherry” with “a light, powdery, marshmallow sweetness” – Virgin Vapor’s description is SPOT ON. An appealing flavor with just the right amount of cherry and hints of light, fluffy marshmallow; it lacked the strong cough syrupy taste that plagues many cherry flavors. Authentic black cherry with subtle, creamy undertones… a nice all day vape that everyone enjoyed. Organic Kona Coffee Milkshake (4/5) – If you’ve been overwhelmed (or disappointed) by coffee flavors in the past, this one is definitely worth a shot. Although it had a subtle espresso aftertaste, it wasn’t overly powerful and was nicely complimented by sweet, creamy caramel and chocolate. A well balanced and enjoyable vape, even for those of us that avoid coffee-flavors. Organic Maple French Toast (5/5) – Very sweet and flavorful! Lots of maple mixed with hints of cinnamon, vanilla and possibly some nutmeg. It has the buttery sweet smoothness of real french toast and we were thoroughly impressed with this tasty, rich and super delicious vape. Organic Plum Crazy (2.5/5) – Plum Crazy was one of the freebies sent with our samples and it received the least fanfare from our team. The flavor itself was pretty accurate, but it was so subtle that it left us hanging and wishing for more. On inhale there was almost no flavor, and during exhale the subtle (but tasty) plum aftertaste was barely noticeable. Not a bad flavor, it just lacked the depth and richness that we typically prefer. Organic Root Beer Float (3.5/5) – Just like the old-fashioned root beer barrel candies, Organic Root Beer Float was a nice mix of spicy, sugar sweetness. We definitely thought it was too light on the creamy, vanilla side for it to be considered an authentic root beer float, and it was probably too sweet to vape regularly, but overall it was still an enjoyable flavor. Organic Wild Blue Punch (3.5/5) – A nice combination of watermelon, blueberry and other fruit flavors, Wild Blue Punch has a noticeably strong emphasis on blueberry and produced a subtly sweet and tangy aftertaste. An decent fruity, summer time vape, but we’ve definitely tried better. Overall, we were pleased with our first Virgin Vapor experience. In every one of our reviews there are winners and losers in the bunch, and Virgin Vapor was no exception. Plum Crazy was definitely weak in the flavor department, and several of us felt like Wild Blue Punch was a bit too tangy. Otherwise, we enjoyed all the other flavors, with Maple French Toast and Cherry Marshmallow the clear standouts. Although their flavors didn’t necessarily knock our socks off, if organic ingredients are your thing then Virgin Vapor e-juice is definitely the best option out there. ABOUT OUR REVIEWS: Since flavor preferences vary and depend on various factors, we use multiple members of our team to complete our e-juice reviews. This Virgin Vapor review was conducted by: Jeremy Salter, Vanessa Salias and Christopher Arthur. Their feedback was gathered, combined and summarized on this page, but please keep in mind that this is the general opinion of our team and should be treated as such. Liquid performance varies depending on the device, and flavor preferences vary for each individual. We strongly suggest that you consider the feedback of others and experiment on your own. This is our Virgin Vapor e-juice rating. How would you rate Virgin Vapor? What do you think about the company and their products? Please share! Terrible customer service. My goodness, just what the heck is the deal with Virgin Vapor? They don’t have a number– the email responses just crawl slowly back, are short and aloof. I might as well send them letters. Their competitors like V2 Mt Baker Halo have exceptional customer service– side chat windows and 1800s. Good quality products are only 1/2 of a business… It’s like a 1 trick pony with Virgin Vapor. Agreed on the VIRGIN VAPOR customer service. They lack COMPLETELY on customer service and to top it off, they also respond with this BS about “oh were a small company….bla bla bla.” Small company, REALLY? Your the “company” and im the “Customer” like im suppose to suddenly be all compassionate about your company size and customer service choices? Umm no. Your company….your choices. You dont have time for my excuses, why would I have time for yours? Also their flavors have the consistency of WATER and yes that is at a 100 percent VG mix. I emailed them (because they have no phone support) to bring this topic up as it was literally killing every tank I put it in and crackling and popping to the point where juice was endlessly in my mouth and throat. And three days later I get a response asking me if I knew how to steep? Really do I know how to steep? Im an experienced vaper with a multitude of equipment so this isnt novice user issue. I made this clear in my original email. Then two days after that I receive another email telling me to let it sit for a month and if I wasn’t happy after a month, to get back in touch. A month (the f””K?). And finally this juice of all varieties gives me horrifying gas. Yes even the ones that dont have alcohol as a base. They should be totally addressing these type issues as they promote themselves to a specific market of people with sensitivities. Its really a sad affair over there at VIRGIN VAOPORS.